Alexa Scimeca Knierim and Chris Knierim were nominated Sunday to fill the U.S. pairs slot at the 2018 Winter Olympics. It was a joy-filled moment for the couple; the other 3 U.S. pairs selected for the World Championships and Four Continents Championships were also happy with their results. Yet, despite the pairs’ triumphs at Nationals, questions kept arising at the U.S. Championships in San Jose last week about the state of U.S. pairs skating. For the first time in almost a century, the U.S. has qualified only one pairs team to the Olympics. It’s also been 30 years since American pairs won their last Olympic medal, and 16 years since their last World medal. In San Jose, the U.S. pair teams were asked what they need to do to contend for a medal again at Olympics or Worlds. U.S. bronze medalist Deanna Stellato feels that U.S. pairs need to perform signature elements in order to stand out in an increasingly crowded international pairs field. “For me, I think with American pairs, it’s very much like running a business. I ran a business in Chicago, and I had 13 competitors in the high-rise [building] I worked in. The only way I was able to compete was to offer something that no one else was offering,” said Stellato. The U.S. pairs know that it’s up to them to raise the technical and artistic level of their skating in order to become competitive on the world stage. Still, while acknowledging the need for continuing improvement, the skaters did express some dismay at the level of criticism frequently aimed at U.S. pairs. Although the U.S. pairs might wish for more support at times, they also recognize that at the end of the day, people want to see results. 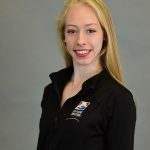 “I don’t think people are going to really change their minds unless we get a medal again, unfortunately,” said Scimeca Knierim. “So I think the American teams are just going to keep doing our thing, and hopefully one day, we will get medals. I mean, we’ve had teams at the World Championships who’ve been top 7 or top 6 before, and it didn’t change anybody’s mind about us. I think we’re all going to just focus on ourselves and, hopefully, the world will change their opinion. “It’s not going to stop us,” Scimeca Knierim declared.